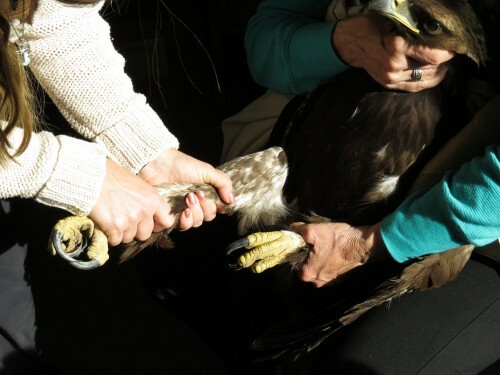 Rescuing A Golden Eagle – It Took a Village /Hawks Aloft Inc.
Often, folks who call about injured raptors over estimate the size of the injured bird, but not always. Such was the case when, on December 9, 2014, we received a call from David Berryman and Craig Sizemore from the Central New Mexico Electric Cooperative. He said, “we rescued a hawk in Estancia, NM.” We dispatched Julia Davis, our Education Coordinator, to go pick up the hawk. When she arrived back at our office, the hawk was wrapped in a warm, insulated canvas, winter-weight jacket and stuffed into a long but very narrow box. We took a peek at the tail feathers and new immediately that THIS WAS NO HAWK! We wondered just how they had managed to stuff the eagle into the small box. Our patient, a hatch year Golden Eagle, seemed nonplussed by the whole affair, and nonchalantly withstood poking and prodding. 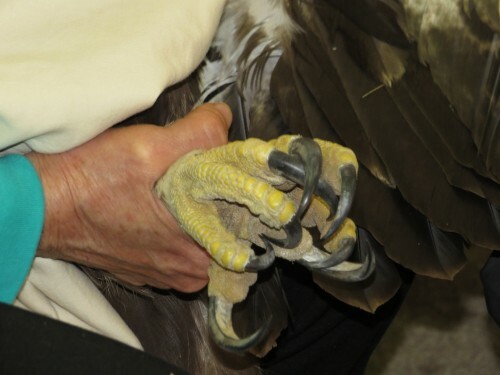 The eagle had damage to the hand area of the left wing, with severe abrasions and blot clots. We cleaned and wrapped the wing, and examined rest of the bird for further injuries. We marveled at the size of the eagle’s feet as well as the weight of the bird. We sent the eagle to one of our veterinarians in Albuquerque for assessment, but got a return call that they could not take care of the bird. It soon became apparent that this fellow was beyond our capabilities here as we do not have sufficient facilities to care for a bird of this size. We called in The Wildlife Center in Espanola, NM. 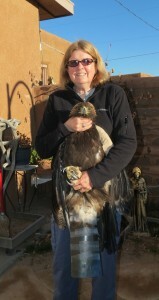 Katherine Eagleson, Executive Director, graciously agreed to take the bird and even drive to Santa Fe to meet us. Before we sent him off, we took some images to illustrate the size of a Golden Eagle relative to other hawks. This time, the eagle traveled in style in an eagle-sized crate with Julia again as his driver. The Wildlife Center has communicated regularly regarding the progress of this patient, one of the most gorgeous birds we’ve ever had the privilege of rescuing. According to Kerrin Grant, Wildlife Care Director at the Wildlife Center, the injury appears to be entanglement with a barbed wire fence. The wingtip of the eagle eventually died and had to be removed so this handsome fella will not be releasable. 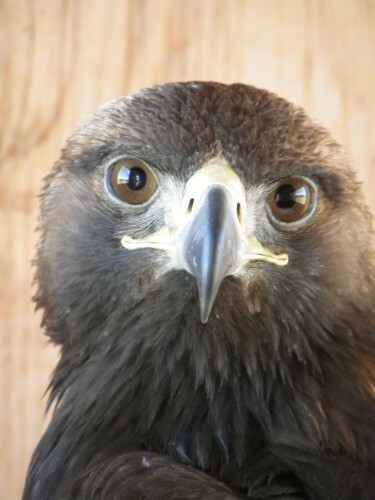 Golden Eagle rescued in Estancia by Central New Mexico Electric Cooperative. Image by Kerrin Grant. 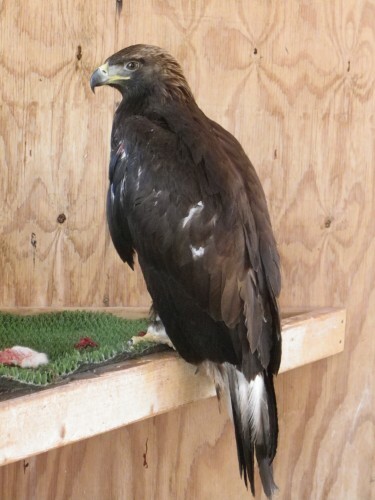 Although the eagle remains in recovery, The Wildlife Center will be seeking permanent accommodations for this young bird, perhaps at one of the eagle aviaries owned by a Native American Tribal Government. We wish this beautiful bird well in his future. We thank everyone who had a hand in saving him: Central New Mexico Electric Coop, The Wildlife Center, and Hawks Aloft — all working together to find the best solution for an extraordinary bird.